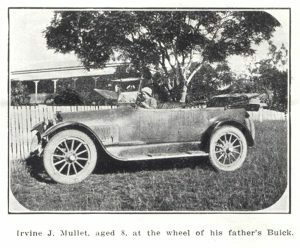 Some time ago Mr. Harry Mullett, pastoralist (who owns Monduran Station, outside Bundaberg), purchased a Buick car from the Howard Motor Co., Brisbane. This car has already done 9000 miles and, as Mr. Mullet says, is going great guns, and he is so enthusiastic about it that had things gone decently in the stock line he intended placing an order for a 1921 model, as he concludes from our description that it must be a very fine car. The subject of our photograph is Mr. Mullet’s son, Irvine, who can handle the Buick Six with confidence. He learnt to drive at the age of seven, and is now a little over eight. He drives from Monduran Station to Bundaberg, a distance of over 40 miles, over some very difficult roads and hills, which include the Bullyard Range. He is quite an expert driver over country roads, and understands how to handle the car on any steep grade. This speaks volumes for the simplicity of the Buick and the easy gear changes, He recently drove to Gin Gin by himself, struck a big sand patch, put on the chain, and got through with flying colors. Although he is not very big, he. is quite strong for h:s age, and is an expert swimmer, a good gun and rifle shot, and a fine rider. This goes to illustrate the great simplicity and ease with which the Buick can be handled, and this fact alone should appeal to the lady driver, and also inspire with confidence those who have daughters who are diffident about handling a car.